Several islands located on the outskirts of Taitung are not only full of natural resources but are also home to thousands of Aborigines. 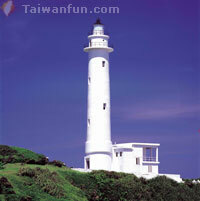 The most popular outlying island is Green Island, situated 33 kilometers east of Taitung in the Pacific Ocean. At its widest, the entire island is four kilometers by three kilometers. Its highest peak is Huoshao (burning fire) Mountain, 280 meters tall. It is also referred to as the "Island of Fire" by locals. Exactly how it earned this nickname is not clear, but most people believe that during the Qing Dynasty, a massive fire broke out on the island during a festival and engulfed the place in flames. Since then, as the story goes, it's been known as "Island of Fire". Rough cliffs that drop into the sea, long coral beaches and the Kuroshio Current create a hearty environment for marine life, making the island Taiwan's premier locale for snorkeling and scuba diving. With a growing, active underwater scene, divers and snorkelers can expect to see Knob, Xenia, Carnation Tree and other corals, as well as myriad tropical fish, including Batfish, Clownfish, Parrot Fish, sea snakes and eels. One underwater point of interest, "The Big Mushroom", is located on the south side of the island and is a collection of coral that is 12 meters tall and 31 meters around! Given the fact that reefs like "The Big Mushroom" grow at about one centimeter each year, marine biologists have determined its age to be over 1,200 years old! This natural wonder has intrigued and amazed scuba divers from around the world. Another water-related activity on the island, Zhao-Rih Hot Springs, currently has three oval-shaped outdoor spring pools as well as a semi-outdoor pool and a huge swimming pool. At night when the stars come out, you can soak in the steamy pool while you gaze at the stars and, in the wee hours of the morning, you can get up and enjoy the sunrise at this scenic spot. 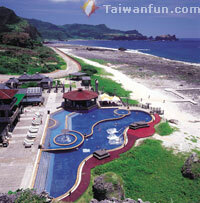 Lanyu Island is located 72 kilometers north of Green Island and 88 kilometers from the southeast side of Taitung. The southern side of Lanyu faces Barttan Island in the Philippines. 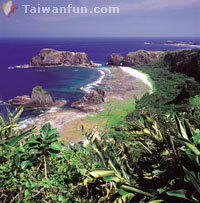 Lanyu was originally called Botel-Tobako and was home to people of the Yami (Tau) Tribe. With a total land area of 45.74 square kilometers, Lanyu is almost three times larger than Green Island and is the second largest island off the coast of Taiwan. It is well-known for its moth orchids and the aboriginal residents refer to this place the "Island of People". The Flying Fish Season is the most prominent event of the year in Lanyu. When the Tau tribe flourished here, they prepared for the fishing season every year, from March to the beginning of May. After making racks on which to dry fish, they would ready their canoes for the harvest. On the first morning of the fishing season, the tribe would gather on the coast and line up their canoes along the shore. Soon a tribal elder would recount the ritual rules and taboos as the fisherman, dressed in the Tau's traditional iron armor with swords in hand, sacrificed boars or hens. After the sacrifice, the fishermen smeared the animals' blood on the rocks and the shoreline, praying for a bountiful harvest and the safety of those at sea. People from the Tau Tribe show their respect to the gods at festivals through dance and music; the traditional dances of men and women differ greatly in mood and choreography. Both styles are definitely worth watching. Usually, these dances can be seen at the Boat Launching Festival, or at the Millet Harvest Festival, which are both large cultural happenings on Lanyu. Though Taitung itself has a seemingly endless number of diversions for eco and cultural tourists, taking a short ferry trip to the islands off the coast will provide you with even more ways to experience Taiwan, its history and its people.